Christopher Wilson studied the lute at the Royal College of Music in London with Diana Poulton. Since leaving he has established himself as one of the leading lutenists in Great Britain, specialising in the performance of renaissance music. He has given many broadcasts on radio and television as soloist and as an ensemble performer. His concert tours have taken him to most countries of Europe, Scandinavia, the Baltic States, Russia, Hong Kong, Japan and the U.S.A.. As well as working with Shirley Rumsey in a duo, they co-direct their own ensemble, Kithara. 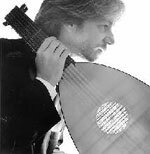 Christopher Wilson has performed with many of the leading early music groups and his increasing interest in the lute song repertoire has led him to work with various song recitalists.